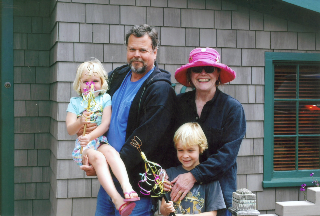 Michael and Diana Bundy have lived in Salmon Creek, a small beach community on the Northern California Sonoma Coast for many years enjoying the glorious local coastal way of life. All the sights and sounds of life at the beach are inspiration and are seen through some of their works depicted in stained glass, copper, paintings and Michael’s wood art. Diana’s work is being collected by those looking for whimsical, colorful reminders of playful summers, sunshine and hot days on the beach. She would like folks to know that individual commission work is cheerfully considered! Michael has always used creative, uncommon touches in his wood art. Whether the project was large, their first house for instance, or small, a gate, bench or garden shed, his whimsical point of view and use of wood makes each piece not only functional but unique. Clients who have worked with Michael for their home remodels and additions appreciate his professionalism, quality of work, attention to detail and that his projects come in on time and on budget. Michael and Diana frequently collaborate on creative solutions for clients. Their projects are designed to be appealing to the eye and professionally well built. If you are interested in creative and functional art for your home or yard consider a consultation with Salmon Creek Design.